If there’s one things the Italians know how to do right, it’s pasta sauces. 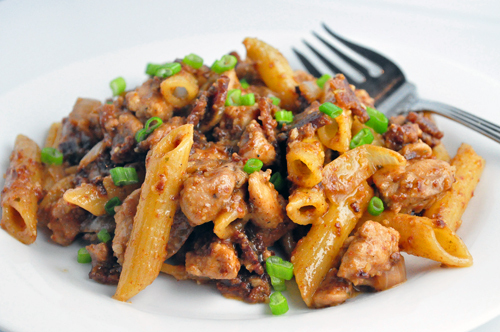 Amatriciana sauce is a classic tomato based sauce that’s full of bacon (pancetta) and onions and it’s delicious. Blame it on the sub-zero temperatures in Denver this week, but I needed something belly-warming and satisfying to get me through and this dish – my riff on an Amatriciana style pasta – seemed like a great idea. Earlier this week I made a really great sundried tomato and almond pesto that I knew would be good on pasta – I just wanted something a little heartier to go with it. So I pulled out some bacon (isn’t everything better with bacon?!) and began to lay it out to bake until crispy in the oven. But the residual fear of bacon grease from my New Year’s Eve burn caused me to rethink my cooking technique and I switched to a pan. Turns out that’s really better for this preparation anyway. (I may need therapy before I cook bacon in the oven again!) I roughly chopped the bacon slices and sauteed them in a large skillet until just about crispy, then very carefully drained the bacon bits. I returned enough to the pan for this dish and put the rest in the fridge for salads, soups, and eggs. 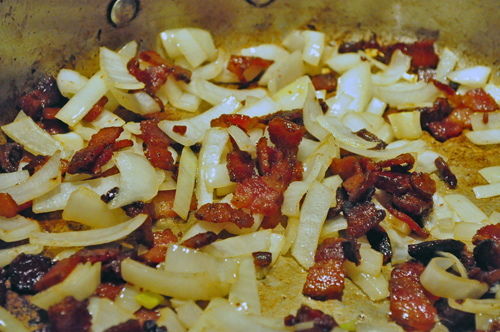 You’ll have enough grease from the bacon to saute the onion in the same pan, so don’t feel compelled to add more oil. 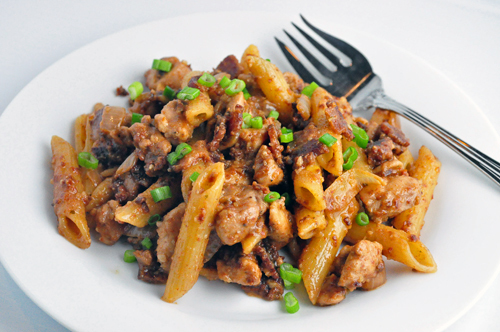 I also added some chopped chicken thighs, but you can certainly omit them if you want less meat in your pasta dish. When the bacon is crisp and the onions are soft and the chicken is cooked through, toss it all together with the cooked pasta and some of the Sundried Tomato and Almond Pesto. Most importantly, make sure to reserve some of the pasta cooking water and stir it into the sauce, a little at a time, until you have a nice creamy sauce. 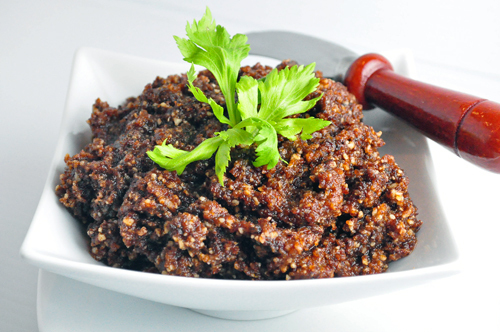 Serve with a sprinkling of Parmigiano Reggiano cheese and enjoy! 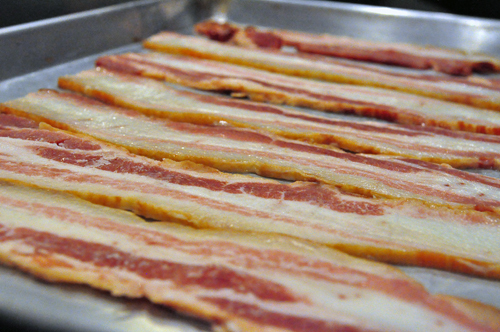 Cook bacon in a large skillet over medium high heat until almost crispy, then drain off excess fat. Return bacon to the skillet along with the chopped onion and cook until the onion is nearly soft. Add chicken and cook, stirring frequently, until chicken is cooked through and the bacon is crispy. Add pesto and cooked pasta to the skillet, stirring to combine while adding some of the pasta cooking water to create a creamy sauce. Simmer for 1 minute, then serve with grated Parmigiano Reggiano cheese for topping.